Porcupinefishes, burrfishes and blowfishes are the common names for the members of the Diodontidae family. They are found in the Atlantic, Indian, and Pacific oceans. They are recognized by their well-developed sharp spines and inflatable body. Their teeth are fused into a single beak-like unit in each jaw and they do not have pelvic fins. 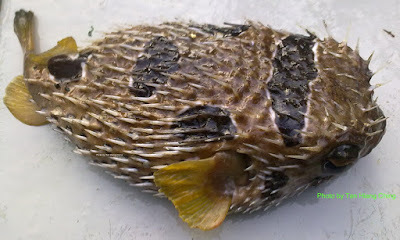 Most of the adult porcupinefishes are found inshore and most of the juveniles are pelagic. They are found on rocky and coral reefs, and over sand, weed, or sponge-covered bottoms to depths of 150 m. They feed on hard-shelled benthic invertebrates which are crushed with their powerful beak-like jaws. Most adults are solitary and nocturnal. They are thought to have toxic flesh. There are 7 genera and about 18 species worldwide. Malaysia has about 4 species. Remarks: May be poisonous - Do not eat.